Why did I do it? Well, my last (real) laptop died last year. When I was considering a replacement, I decided that I’d probably get more use out of a tablet, since it would be portable enough that I could take it more places. I found a good deal on a refurbished Samsung Galaxy Note 8, and bought one. 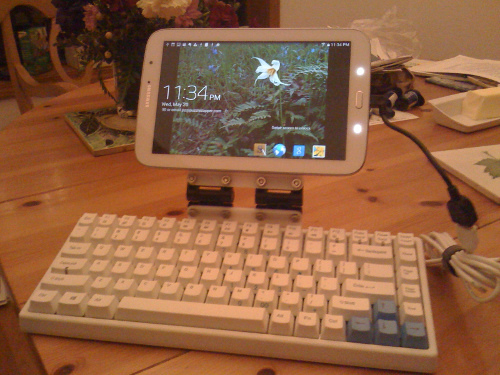 Now, there are tablet cases with integrated keyboards that are made for just this purpose. But these keyboards typically require some compromise in typing comfort, compared to a standard keyboard. For my desktop keyboard, I use a mechanical keyboard without a tenkey, since I find that I never use it anyway, and its absence allows me to place my mouse closer to the keyboard, which is ergonomically advantageous. (If you are a particular sort of keyboard geek, you may be interested in knowing that it uses Cherry MX Brown switches.) But for the fake laptop I wanted to make, I wanted something more compact than my desktop keyboard. There are some highly compact keyboards out there, but I did not want to lose the standard arrow key block. Keyboards that are more compact than a tenkeyless keyboard, but that retain the arrow key block, are a rarer breed. But a good deal on just such a keyboard, a Keycool 84, popped up on MassDrop, and I sprang for it. (You may notice a pattern. I am a sucker for a deal.) I might have preferred a keyboard without a function key row, but this was close enough. Having determined that I wanted what were called either “friction hinges” or “torque hinges”, the next problem was the matter of exactly how sticky the hinges needed to be. The stickiness of a particular hinge is rated according to the torque required to move it. This brought back memories of high school physics, but I wasn’t entirely confident that I could calculate the proper value for the torque of the hinge, given the weight and dimensions of the tablet. An online torque calculator was helpful. Both adjustable torque hinges and constant torque hinges are available; the former appealed to me because they would provide some leeway in case I wasn’t quite right about the proper stickiness for the hinge. Adjustable torque hinges are also the cheaper option, and I found a deal on ebay for a set of four Southco E6-10-301-20 hinges at a better price than I could get for one hinge of that model anywhere else. Unfortunately, the leaves of the hinges weren’t long enough to be able to attach directly to the keyboard and the tablet. I needed a couple of extension pieces. I settled on lasercut plastic for these. (I ordered the laser cutting though Ponoko, as usual.) In the past, I’ve mostly used acrylic for my lasercut puzzles, but for this project I used delrin. Acrylic can break under compression; it seems that delrin is better when you are using screws and nuts to fasten things. At this point what remains to be discussed is how I attached the delrin pieces to the keyboard and the tablet. As I said before, the tablet had to be able to be attached and unattached. I decided to use Velcro for that. I placed four adhesive-backed Velcro squares (loop side) on the tablet, and the matching hook squares on the delrin piece. On the keyboard side, I didn’t care if the delrin piece was attached permanently, and I wanted something that would make a stronger connection than Velcro, so I used a piece of 3M automotive super strength molding tape, which I had lying around. I got the placement of the delrin piece very slightly off, but I was stuck with it, as the super strength tape was indeed as advertised. And that’s it. Of course, none of this would be at all useful if I couldn’t connect the keyboard to the tablet. I used a USB On The Go adapter for that, which works fine, although I might at some point see if I can find a shorter keyboard USB cable, since the one that came with the keyboard is quite a bit too long for this purpose. The one other thing I am a little unhappy with is that the hinges won’t close as far as I would like. Slightly thinner delrin might have fixed this problem, but if it were too much thinner, it wouldn’t hold up the tablet without bending.